Certified organic, unrefined, non-GMO coconut oil. Cold pressed without the use of heat or chemicals and packaged in BPA-free jars. Coconut oil is natural substance obtained from fresh coconuts. It's versatile and can be used as a butter substitute, baking ingredient or as a high-heat cooking oil. It's also popular for skin/body/hair purposes. How does coconut oil support health? 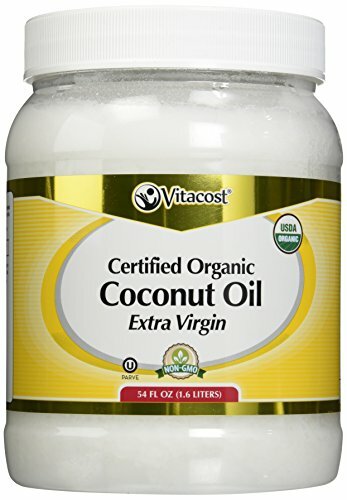 Why choose Vitacost Coconut Oil Extra Virgin? Superior quality at a great value! Vitacost nutritional products are manufactured to high standards of quality, efficacy and safety. Each Vitacost product meets or exceeds the standards and requirements set forth in the FDA's Code of Federal Regulation (21 CFR, 111) Current Good Manufacturing Practices (CGMP). Free Of Milk, eggs, peanuts, crustacean shellfish, fish, soy, gluten, titanium dioxide.